Margaret H. School of Nursing at Beebe Healthcare is a diploma nursing program located in Lewes, Delaware. Since its inception in 1921, the school has held a strong tradition of academic excellence and extensive clinical experience in providing quality nursing education. The School of Nursing offers a comprehensive NLNAC-accredited nursing curriculum that prepares graduates for the demands of a diverse healthcare profession. The two-year curriculum is presented in two 17-week semesters per year. A planned orientation occurs prior to enrollment. The prerequisite courses provide a strong academic foundation in the basic sciences and humanities. These courses may be taken through Delaware Technical & Community College, Owens Campus, with registration facilitated through The School of Nursing or, if the student chooses, from a college near their home. In addition, a Nursing Assistant course within two years of enrollment or current certification as a nursing assistant is required. When students have successfully completed the prerequisite courses, they will then start the first year of nursing education at The School of Nursing. Clinical experience for students begins in the prerequisite Nursing Assistant course. The first-year nursing courses at The School of Nursing provide intense clinical experiences in both inpatient care areas and outpatient settings that increase and progress through a variety of learning opportunities. Local, state, and regional community facilities are used to provide diversified clinical experiences in nursing management and acute, critical, community, transitional, and rehabilitative care. In addition to Foundations of Nursing and Nursing Care of Adults, the second-year of the curriculum includes Nursing Care of Special Populations and Advanced Concepts of Nursing. The diploma in professional nursing is awarded at the completion of the nursing curriculum. This qualifies the graduate to be eligible for RN NCLEX (nursing) licensure. 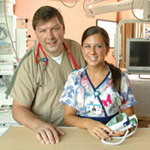 With completion of the prerequisite courses, the nursing diploma curriculum at The School of Nursing, and three additional courses—English II, Macroeconomics, and Oral Communications—the student will have completed the Bachelor of Science in Nursing (BSN) Lower Division Requirements for Wilmington University. The School of Nursing has an articulation agreement and a specific curriculum plan with Wilmington University to facilitate BSN completion with one additional year of study. Information is also available for students to complete a BSN through the University of Delaware RN to BSN program. Students who apply for financial aid at The School of Nursing must complete the "Free Application for Federal Student Aid" (FAFSA). This form can be completed online or can be obtained from The School of Nursing office.